Use a food processor, blend chillies, ginger, lemongrass, turmeric, shallots, garlic, and candlenuts until smooth like paste. Add 2 tablespoon oil, fry all the mixture until smell nice. 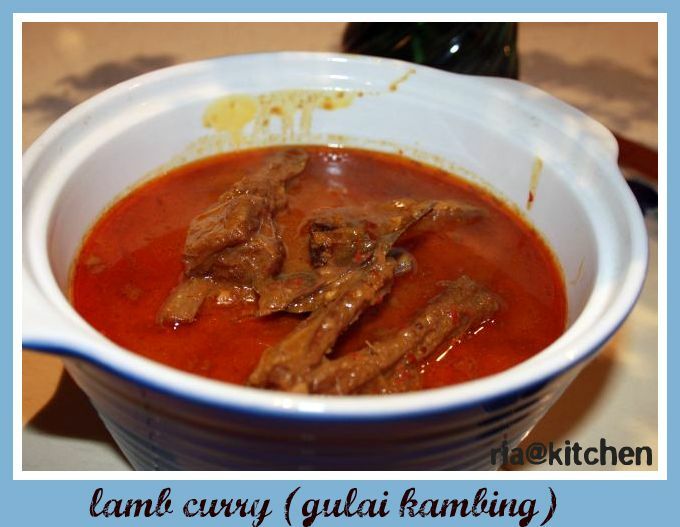 Add the riblets, kafir lime leaves, cinamon, curry powder, and star anis. Mix them together, and cook with lid on for about 3 minutes. Then, hot water, coconut milk, sugar, salt + pepper. Cook until the riblets is tender. Stirring occasionally. If it’s a bit dry add a bit more water. Place the flour on a plate or in a plastic bag, dust the shanks and brush off any excess. Heat 1/2 tbspn of the oil in a large heavy-based saucepan or stove top casserole dish over medium-high heat. Brown the shanks in batches and transfer to a plate. Combine the stick, tomatoes, wine and thyme in a jug. Heat the remaining oil in the pan. Cook the onioin and garlic for 4 minutes, or until just soft. Return the shanks to the pan and add the liquid mixture. 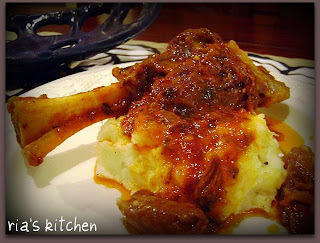 Reduce the heat to low, cover, and cook the shanks for 2 hours, stirring occasionally. Remove the lid and cook, uncovered, for 30 minutes more. Stir through the parsley. Season with extra salt and cracked black pepper, if desired and serve with mashed or steamed potatoes. The cheaper cuts of lamb, such as shank, shoulder and neck are ideal for slow-cooked dishes because the meat is kept tender and juicy by the surrounding fat. Beef cuts such as chuck or blade steak are also good. In a large bowl, combine mince, breadcrumbs, egg, onion, zucchine, pine nuts, parsley, sauce and thyme, and season to taste. Put half the mixture into loaf tin, make a deep hollow, add half the mozzarella and add another half of the mixture on the top. Bake for 1 hour or until browned. Pour over pasta sauce and sprinkle with the rest of mozzarella. Bake for a further 5 – 10 minutes until cooked through and cheese has melted. Serve with boiled/steamed veggies (carrot, peas, potato, sweet potato) or with rocket and cherries tomatoes and chips in the summer time. combine lemongrass, sauce, sugar, garlic, and ginger in bowl. add cutlets, cover, refrigerate 3 hours or overnight. drain cutlets from marinade, reserve marinade. place cutlest on wire rack in baking dish, bake, uncovered, in moderately hot oven about 25 minutes or until tender, brushing occasionally with reserved marinade. serve with tropical relish and jasmine rice or mash potatoes. combine vinegards and wine in pan, simmer, uncovered, 3 minutes. add fruit, pepper, honey, peppercorns and bay leaf. simmer, uncovered, about 10 minutes or until mixture thickens. discard bay lear, stir in coriander;cool. this is a real good one for barbeque. very refreshing for a hot summer day, very easy to make and very yum! i grill the lamb and sweet potato on a oven grill if you don’t have a barbie or lazy to use it. place the oil, vinegar, mustard, honey, garlic, salt and pepper in a small bowl and stir to combine. set aside. preheat barbeque or char-grill to medium heat. brush the lamb and sweet potato with oil, salt and pepper. barbeque the sweet potato for 4 min each side or until tender. barbeque the lamb for 6-8 min each side or until cooked to your liking. allow the lamb to rest and then slice. 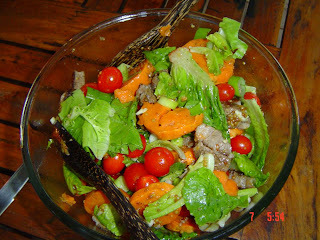 place the lamb, sweet potato, cos, tomatoes, green onions and dressing in a large bowl and gently toss to combine. serves 4. Combine the oil, lemon and seasonings. Pour over the cutlest and leave for 30 minutes. When ready to eat, pre-heat the grill until very hot and cook the marinated cutlets to the desire degree. Stir fry lamb in the batches. Set aside. Stir fry onions, garlic, shallot and chillies. Blend corn flour with soy sauce, oyster and stock. Return lamb and wait until thickened. Add broccoli, capsicum, etc, if desired. Serve with rice.